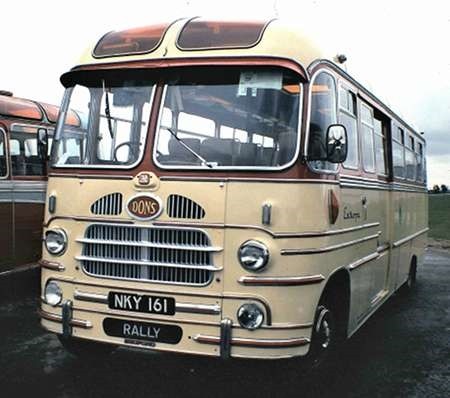 NKY 161 started life with Fairways of Bradford in 1957. It is a Bedford SBG with Yeates C41F body. By the time of this view, at Duxford on 24th September 1995, It was with Don’s Coaches Great Dunmow Essex. Great Dunmow is one of the once-delightful villages near Stansted Airport, where many of the residents didn’t want the facility extended. They were ignored, as indeed were the folk twenty or so miles up the road at Lakenheath and Mildenhall who did want to host the third London Airport. Ah, well. It’s called democracy! Dons acquired this from Fairway when it was only two or three years old. Dons sold it for preservation (in the 1970s?) but later reacquired it. I only met Don Hale once but I would agree with the comment on the company website that he was a true gentleman. The business continues, now in the hands of Steve Harvey whose family had been associated with the business for many years. It may be the camera angle, or perhaps its the body style, but compared to say a Duple or Plaxton from the same era, it looks very narrow, is it a 7’6” chassis? A handsome beast none the less. Thanks for your thoughts, Nigel and Ronnie. I’m not sure if it is a narrow chassis, but I am sure that someone among the readership will complete our education in this matter. Certainly, there have been comments in the past about the features of a Yeates body and I wonder if it’s just a bit taller than Duple or Plaxton to accommodate all that brightwork! The SB chassis were all the same size, the distance across the rear (double) wheels being 7ft 3 7/16" It was the bodies that were different widths. In the case of NKY 161 it is an 8ft wide body. Its the height that makes it look narrow.